This functional little humidifier makes maintaining proper humidity levels easier than ever. 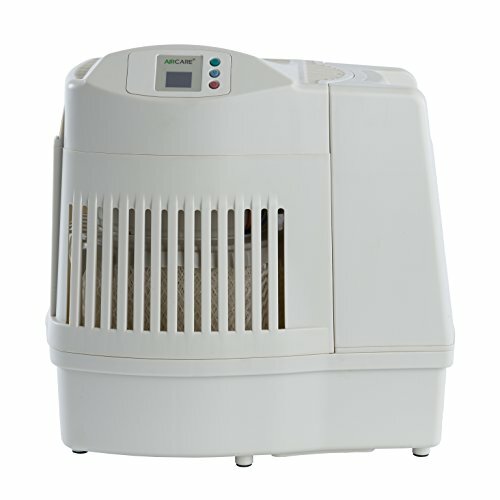 Our humidifiers work by adding invisible moisture to your environment by moving dry air through a saturated wick. Maintaining proper humidity levels between 30-50% in your home/office/workplace has been scientifically proven to help prevent the flu and allergies. Proper humidity hydrates your skin, alleviates dry eyes, scratchy throats and can reduce snoring. With a doctor's approval increased humidity can reduce asthma and allergy symptoms. It also protects fine furniture, musical instruments, collectibles and wood floors. Proper humidity makes you feel warmer allowing you to lower your thermostat setting which will save money. Use of a ceiling fan helps distribute moisture output. WARNING: This product can expose you to chemicals including benzene which is known to the State of California to cause cancer and birth defects or other reproductive harm. For more information go to www.P65Warnings.ca.gov. If you have any questions about this product by AirCare, contact us by completing and submitting the form below. If you are looking for a specif part number, please include it with your message.